Piedmont Park is one of the most vibrant public spaces in the City of Atlanta. It attracts festivals, fairs, markets, athletes, musicians, sunbathers, dog-walkers and city-dwellers wishing to commune with nature. As a tourist of the Park, evident by the cameras in tow, I was astounded by the friendliness of the Park's other visitors, and animal residents too, not to mention its beauty following a recent refurbishment. A young couple, shoes cast aside with sketchpads in hand, sitting on one of the Lake Clara Meer’s docks, remarked without provocation on how beautiful the view was from the site where they had perched and were more than willing to share with others. After admiring the view they had discovered, I asked if I could take their photo for a tourism blog and they enthusiastically agreed, without deliberation. They donned a smile for the first "candid" photo, then quickly returned to their relaxation and enjoyment of the serene setting. The second photo perfectly captured that they'd accomplished what they came to the Park to do that day. A short while later, I and my fellow tourist—also a photographer—passed a young lady who, noticing our cameras, excitedly told us about a "giant" hawk she'd seen by the lake a couple of days earlier. My friend quizzically said, "What an odd thing to say." My rebuttal was that she obviously knew we were there to experience all the Park had to offer—again, the cameras were very telling—and she was merely excited to share. Satisfied with that explanation, my colleague accepted that we were indeed in a friendly land. 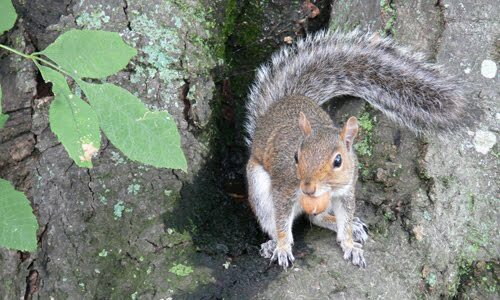 Within minutes, and throughout our visit, we encountered life of many species, the friendliest of which were squirrels…yes, squirrels! Other creatures sharing the rolling hills of the 100-plus acre park are chipmunks, ducks, geese, butterflies and canines (hosted by their human friends). The Park recently opened an expansive Dog Walk near the Park Drive bridge, accessible from Monroe Drive. Oh, and the "Eagles" will be performing on October 15 as part of the city's "The Green Concert." The Park has a public swimming pool that when I saw it in its refurbished state, I was certain that it must belong to the nearby Piedmont Driving Club. I mean, how could a pool that beautiful be open to the public? Just prior to this visit, I'd seen the pool on an evening stroll around the park, illuminated against the night sky (the Park is open until 11:00 p.m.), and reveled in its pristine condition. Seeing the pool a couple of days later, filled with frolicking youngsters and playful adults, was yet another indication that Atlanta is indeed a great city in which to live and visit. We had just missed the weekly "Green Market," which is open every Saturday 9:00 a.m. to 1:00 p.m., May 1 through December 11. Near the 12th Street entrance, the Market features local produce, juices, cooking demonstrations, baked goods, artists and more. I'll see them next weekend for breakfast! 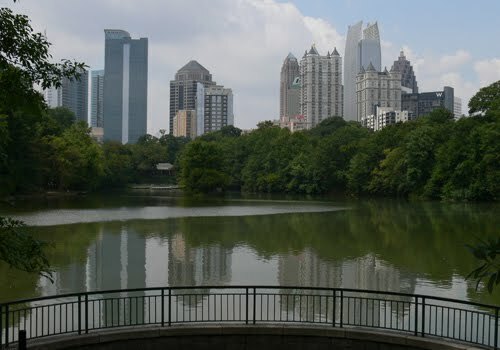 With origins dating to 1887, Piedmont Park has in recent years undergone a transformation giving it a beauty that rivals the spectacle of the city's glass and marble skyline, some of which can be seen from vistas around the Park. The Park itself was designed by the sons of the founder of landscape architecture, Frederick Law Olmsted, whose works include Central Park in New York City, the U.S. Capitol grounds in Washington, D.C., and the Biltmore Estate in Ashville, North Carolina. Although not built precisely according to the original Olmsted plans, the recent restoration project honored the original design. Am I going back to Piedmont Park? Absolutely. in fact, next time I will likely bike through the Park. Immediately after this visit, I stopped by "Skate Escape," a skate and bike shop adjacent the 12th Street entrance on Piedmont Avenue, where Park visitors can rent or buy skates and bikes. I purchased a bike rack for my car, went home, bought my bike back to the shop for a tune-up, and amazingly it was ready within one business day. Piedmont Park is definitely on my list of regular sites to visit and to bring fellow tourists.